Arlo Pro vs Arlo Ultra – Should You Spend More for Ultra and 4K? There’s a new Arlo in town: Arlo Ultra. Its biggest upgrade is recording in 4K Ultra HD, but what else sets Arlo Ultra apart from its previous versions? In this article, we will break down the differences between Arlo Pro vs Arlo Ultra. Since the Ultra costs more money, we will help you decide whether or not it’s worth splurging on. We are also updating this article throughout 2019 with the latest announcements about Arlo Ultra and the new SmartHub. 1.3 Is Arlo Ultra Worth It? Affiliate Disclosure: This page contains affiliate links, which earn us commission at no cost to you. The writers of this blog were previously sent a free sample of Arlo Pro for review. They were not compensated in any other way. The opinions are 100% their own and not influenced. The recently announced Arlo Ultra has several upgraded features worth mentioning. We will likely test these hands-on in a future Arlo Ultra review. 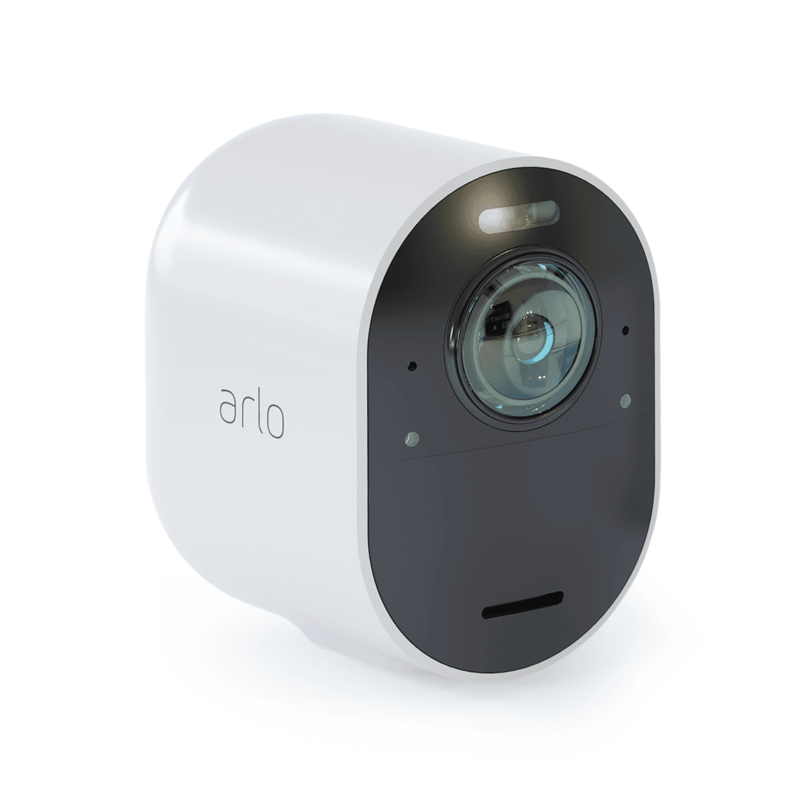 For now, here are the specs from Arlo. 4K Ultra HD image sensor. This gives the camera higher video resolution, so users can zoom in and still maintain accurate detail. This makes it even easier to identify faces, license plates, and more. In comparison, Arlo Pro only records 720p footage, while Arlo Pro 2 has 1080p. HDR (high dynamic range). The new Arlo Ultra’s HDR improves its brightness of colors and contrast. This makes the images more lifelike so they aren’t washed out. Arlo also says the camera has advanced image processing. Powerful LED spotlight. This bright light near the top of the camera helps illuminate the picture more accurately. It is motion-activated, but we still don’t know exactly how bright the light is. 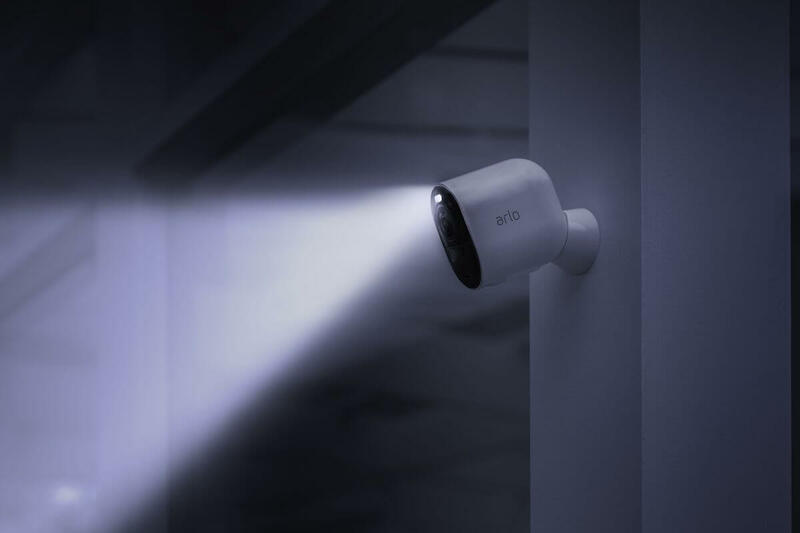 Arlo says that the light, combined with enhanced night vision, allows for color night vision instead of black and white. This basically eliminates the need to buy and install the Arlo Light near your camera. 180° field of view. This is wider than most security cameras on the market: one competitor with this feature is Zmodo Snap Pro. The wider view makes it easy to capture more action on the sides of the frame. In addition, the cameras have advanced “dewarping,” preventing the images from being warped with their wider angle. Auto zooming and tracking. This is a new feature exclusive to Arlo Ultra within Arlo’s cameras. The camera automatically zooms in and tracks movement within the frame. Updated base station. Arlo Ultra includes a new base station for the cameras, called Arlo SmartHub. Its main upgrades are: Z-Wave/ZigBee compatibility, ArloRF, support for the new Arlo Security System. ArloRF is a radio technology for efficiently communicating with cameras at long ranges and extended battery life. Just like the previous version, the hub connects your cameras to your Internet. It also has a microSD slot for local storage. The SmartHub is compatible with previous Arlo cameras, so you can keep your old Arlos and use them on the SmartHub. Z-Wave/ZigBee hub. During CES 2019, Arlo announced that their SmartHub would work with Z-Wave and ZigBee. Their goal is to build out their own Works with Arlo platform. Using only the Arlo app, you will be able to automate all of your Z-Wave/ZigBee devices in one place. This is Arlo’s attempt at replacing your SmartThings/Wink hub. Updated power cable. The new power cable that comes with Arlo Ultra attaches to the camera using magnets. Comparing Arlo Pro vs Arlo Ultra, the Pro plugs in instead of using magnets, which is less waterproof. Both power cords are USB, making it easy to charge or plug in anywhere. Improved audio. Arlo says they improved the audio on Arlo Ultra, with dual-microphones and two-way audio that has advanced noise cancellation. This is designed to reduce background noise from traffic or wind. Compact design. The new Arlo Ultra is sleeker than the Arlo Pro. 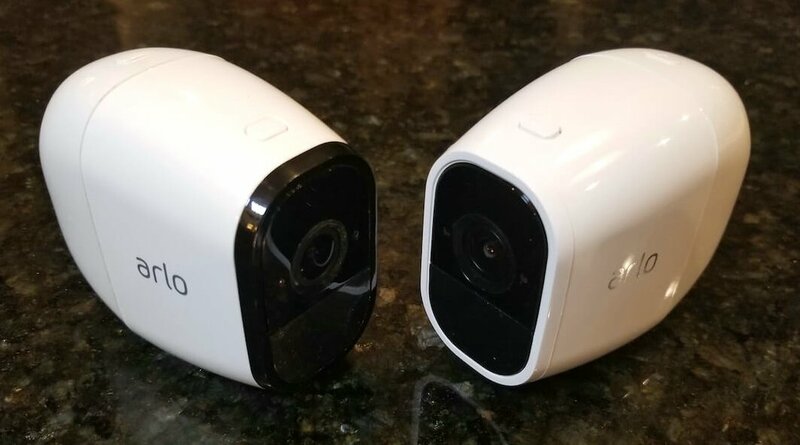 As soon as we get our hands on the Ultra, we will compare its size side-by-side with Arlo Pro. Siren. The camera’s new, 90 decibel built-in siren can be triggered automatically when the camera detects motion or audio, or manually turned on using the app. It triggers the light to switch to a red strobe light as another way to scare away intruders. Arlo Smart Premier one year subscription included. This is a $120 value. After the free year, you have the option of continuing Arlo Smart Premier for $10/month, or just using Arlo’s free plan. Scroll down for more details on what comes with this upgraded plan. As soon as Arlo Ultra ships, we will test these upgrades side-by-side with the Arlo Pro and Arlo Pro 2. This is the best way to really see what difference 4K, HDR, and the other features make. Keep an eye on this Arlo Ultra review for updates. Despite their differences, both cameras function mostly the same. Whichever camera you choose between Arlo Pro vs Arlo Ultra, you can expect the following features on both cameras. Easy setup. By downloading the Arlo app and connecting it with your cameras, you can easily use WiFi to monitor your Arlo in just a few minutes. If you decide to plug in the camera, just make sure you install it near a power outlet. Wireless design using batteries. With rechargeable batteries, you can use either Arlo Pro or Arlo Ultra on battery power for a completely wire-free set up. Arlo Pro lasts up to 6 months for average use, and Arlo tells us that the Ultra is expected to be comparable or even improved compared to the Arlo Pro. Free cloud storage. Arlo Pro and Arlo Ultra both offer a 7 days of free cloud storage. However, Arlo will charge extra for a Premium Video Upgrade if you want to store the Ultra’s 4K videos in the cloud. This costs $1.99 per month per camera. Weather-resistant. Both cameras are designed for outdoor use. They can withstand freezing or hot temperatures, along with snow, rain, wind, and other harsh outdoor elements. Same app. Use the Arlo app to view clips of motion and arm/disarm your cameras. Two-way talk with microphone and speaker. Both cameras make it easy to talk and listen to your visitors. The built-in speaker and microphone work together so you can hear what guests are saying, and respond to them within the app. Smart home compatibility. When you compare Arlo Pro vs Arlo Ultra, you will find that both cameras are compatible with the same smart home gadgets, including Alexa, Google Assistant, SmartThings, IFTTT, and others. Magnetic mount. Both cameras install using a magnetic mount (though the design of each mount is slightly different). Set up either mount by screwing it to the wall. Then you can simply connect the magnet on the back of the cameras to the magnetic base on the mount. Is Arlo Ultra Worth It? Now that we’ve analyzed the differences between Arlo Pro vs Arlo Ultra, let’s decide if the new Arlo Ultra is worth it. Already available for preorders from Best Buy and Amazon, the new Arlo Ultra will set you back $600 for the kit with two cameras and the new base station. For one camera and the base station, it will be $400. This is a steep commitment for only two cameras monitoring your home. Add in optional charges like extra cameras, an Arlo Smart subscription after the first free year expires, and the additional monthly upgrade for 4K cloud storage, and you are suddenly paying quite a bit for smart home monitoring. Still, the extra cost is for some amazing cameras, as long as they live up to their specs in testing. Since Arlo will sell the Ultra as a standalone add-on camera, maybe you can add one to your existing set up. The camera is compatible with the previous version of the base station, though of course Arlo recommends opting for the new base stations so you can use their ZigBee/Z-Wave functionality and other upgrades. Depending on how well the new ArloRF and ZigBee/Z-Wave compatibility work, Arlo Ultra may be worth it so that you can control all of your smart home in one place. One question that remains is how Arlo Ultra will perform transmitting 4K video wirelessly to the base station, especially when you add in walls and distance from the router. Arlo Ultra was briefly sold at Best Buy in January before it was pulled from shelves due to 4K streaming issues and glitches. Its release date on Amazon continues to get delayed, and currently says March 24, 2019. The company is working on improving Arlo Ultra with some firmware updates. But until Arlo fixes the issues with their Ultra, it may be best if you skip it for now. Plus, Arlo Ultra’s battery life is a big concern for similar concerns about its 4K. 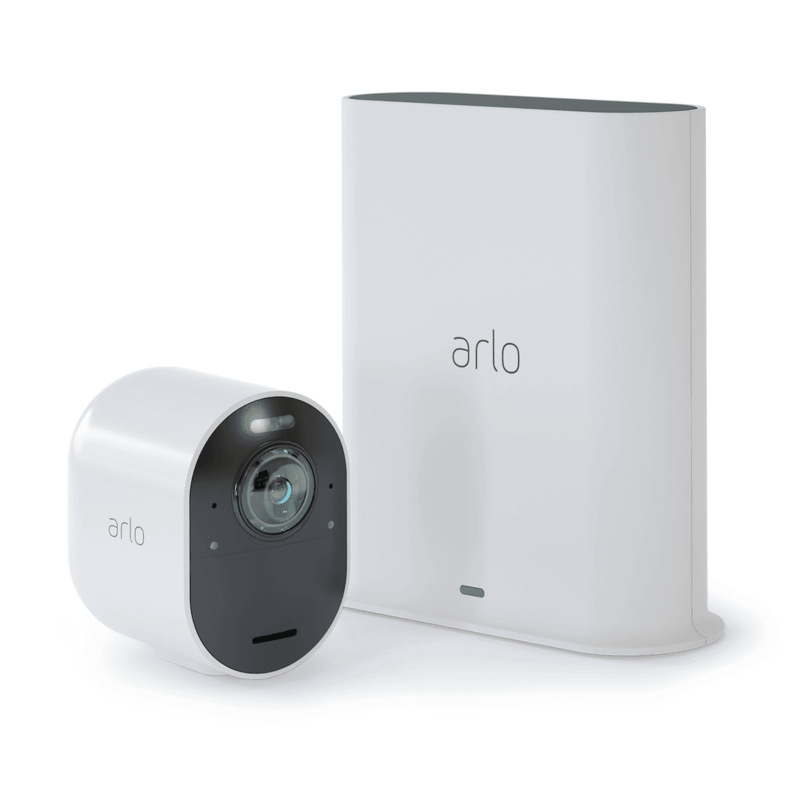 Arlo says that the range and battery life will be superior thanks to ArloRF. The video quality, lag, and battery life are all features we will definitely test when we can do a full Arlo Ultra review after it’s re-released. Arlo Pro and Arlo Pro 2 are the best alternatives for the Arlo Ultra. Arlo Pro 2 has 1080p footage and rechargeable batteries, giving it the same base features as the new Arlo Ultra. If comparing Arlo Pro vs Arlo Ultra has you feeling like 4K footage will be overkill, then save your cash and go with either Arlo Pro or Arlo Pro 2. Both Arlo Pro and Arlo Pro 2 are similar, but we specify their differences in our comparison article. Arlo Pro 2 adds 1080p, along with three additional features that require the camera to be plugged in to work: 3-second look back, continuous video recording, and motion zones. Besides Arlo Pro and Pro 2, I would not recommend the original Arlo Wire-Free, which doesn’t have rechargeable batteries. Its features are too basic and outdated compared to most advanced security cameras available today. 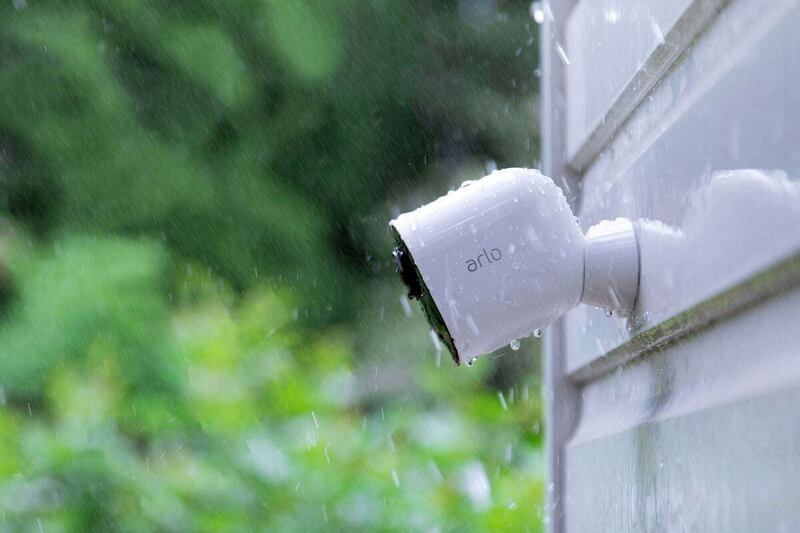 The other outdoor option is Arlo Go, which is more of a niche camera since it works with a cellular connection to monitor your cabin, barn, or other areas without internet connection. Besides Arlo Pro vs Arlo Ultra, there are several other brands that offer cameras to monitor the outside of your home. None of these cameras offer the 7-day free cloud storage that you’ll get with Arlo. While Arlo sells their upgraded storage with Arlo Smart, and storing 4K videos will cost you an additional monthly fee, Arlo’s included 7 days of rolling free cloud storage is very unique. The “free” plan for these competitor cameras offer very limited cloud storage, so you have to essentially plan on upgrading to the monthly subscription. Ring offers several outdoor cameras with a built-in light. Maybe that’s where Arlo got the idea to add a light to Arlo Ultra…? Ring Floodlight Cam is the brightest option, but there’s also the Spotlight and Stick Up Cam. None of these require the Ring doorbell or any hub connected to your router, which is one perk over Arlo cameras. You can read our comparison of Ring Floodlight vs Spotlight vs Stick Up Cam for more details. Nest Cam IQ Outdoor has a 4K sensor. So while it doesn’t record in 4K, it still has comparable specs in some ways. Nest Cams integrate nicely into the Nest smart home ecosystem, making them easier to monitor next to your Nest thermostats, doorbell, lock, or security system. Make sure you compare the features of the different Nest Cams to help you pick the best camera for your set up. The free plan on all Arlo cameras includes 7 days of free cloud storage. One benefit of the Ultra when looking at Arlo Pro vs Arlo Ultra: the new Ultra comes with 1 year of upgraded Arlo Smart Premier complimentary. This adds extra features and cloud storage options. Read more about the upgraded Arlo Smart and Arlo Smart Premier plans below to understand whether or not you will need to upgrade from Arlo’s free plan after the year of Arlo Smart Premier expires. Arlo Smart adds computer vision to tell you if the motion is a person, animal, vehicle, or package. This is a huge upgrade. My Arlo Pro cameras (without Arlo Smart) send me push notifications daily for the neighborhood cat or any birds hanging around my front yard. With all of these false alarms coming in, it’s easy to ignore an actual alert for someone at my porch. 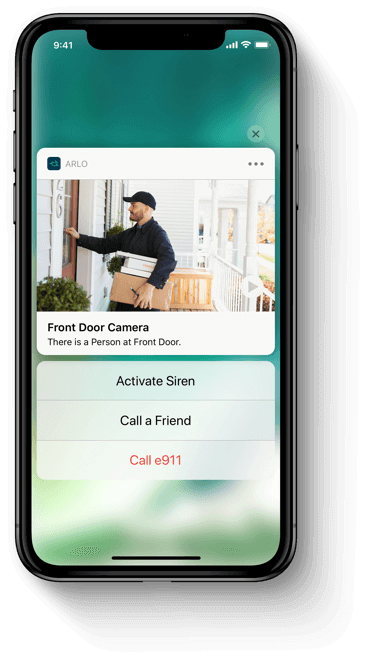 Other features that come with Arlo Smart include viewing notifications to take action directly on the lock screen, and setting user-defined motion zones. These custom motion zones also reduce false alarms because you specify which areas you want to monitor, and have your cameras ignore the rest. As I mentioned earlier, Arlo Ultra includes a one-year subscription to Arlo Smart Premier. In addition to the features above that come with Arlo Smart, bumping up your subscription to Arlo Smart Premier adds 30 days of 1080p cloud recordings instead of the initial seven days. Premium recording for storing 4K videos in the cloud requires an add-on subscription. Alternatively, you can store 4K videos locally using the SmartHubs’ microSD slot. The other added features are that you can support 10 cameras instead of 5, and use e911 for guiding emergency responders to your home. This is only available in the United States. Using e911, you are automatically connected to the authorities closest to the address specified in Arlo. Even if you are away on vacation, your call will go to the department near your home, not your current location. If you like Arlo Smart Premier’s features, but need capacity for more cameras and additional cloud storage, Arlo Smart Elite is also available. 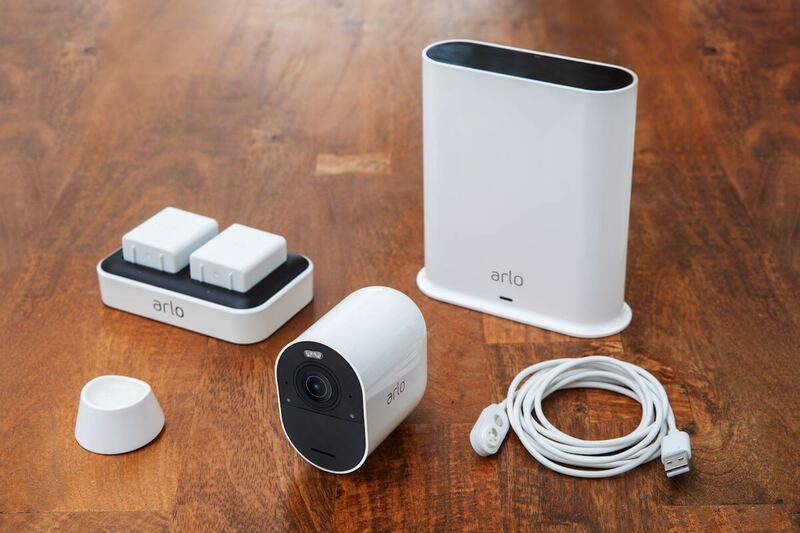 This is the highest option that expands your support to 20 Arlo cameras and includes 60 days of cloud storage. That wraps up our comparison of Arlo Pro vs Arlo Ultra. What do you think – will you splurge on the Arlo Ultra, or go another direction for your home security? Comment below with your thoughts! I just found out that the new base called base 5 by arlo tech reach 400-500’ but only have a micro sd card connection? wich will limit the local storage capacity and cost of a large capacity micro sd could be significant ! Why not keeping the usb as well ? May be it’s a way to keep you to subscribe ! Great article, very thorough. I’ve been looking for outdoor cameras that are HomeKit compatible. When the Ultra was announced I was very excited, but since the Pro 2 will be HomeKit compatible via a software upgrade, that opens up further options. I’m very much looking forward to your review once the units ship so I can make a decision. Nonetheless, I’m glad more HomeKit devices are finally getting to market. Do you know if there is a compatible solar panel for the battery version of the Arlo Ultra?